All Posts Tagged With: "Tanith Belbin"
Do you live in New York or planning to visit? In honor of the strength of their bond as teammates and to celebrate the holiday season Tanith Belbin and Ben Agosto, Olympic Silver Medalist Ice Dancers, along with Everlon invite New York to come join them at the Rockefeller Center Ice Rink for a special appearance followed by a weekend of free skating! Hosted by Everlon, Ms. Belbin and Mr. Agosto will open the weekend by skating a special routine Thursday, December 10th at 12:30pm. 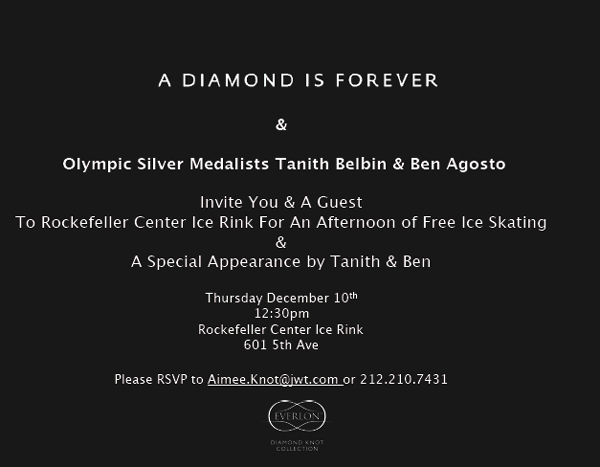 Thereafter anyone who comes to the Rockefeller Center Ice Rink for the 12:30pm – 2pm sessions Thursday, December 10th through Sunday, December 13th will be treated by Everlon to a free session of skating.